NEW ITEMS ADDED ALL THE TIME! These models have been realized with our HOPPIDUS modules; this is a truly modular system so all elements of this set are compatible with the rest of the range. This means you can also add more elements from the complete HOPPIDUS range or get more Ready-to-play models to expand and customize your camp or fortifications! We are always working to bring you many more Ready-to-play finished camps, either as separate elements or assembled, based on 4mm plywood or MDF and painted as shown; please keep in mind however that these will necessarily be available only in limited numbers. If we happen to be out of stock at the time of your purchase we will eiher refund your payment or treat them as a commission order (your choice of course!). YOUR SPECIAL PROJECTS are also always welcome, inquire freely! Just remember we can make any model you like, in any scale and size; we're here to help you choosing the best solution for you, and you can contact us at any time, so just for any special requirements! 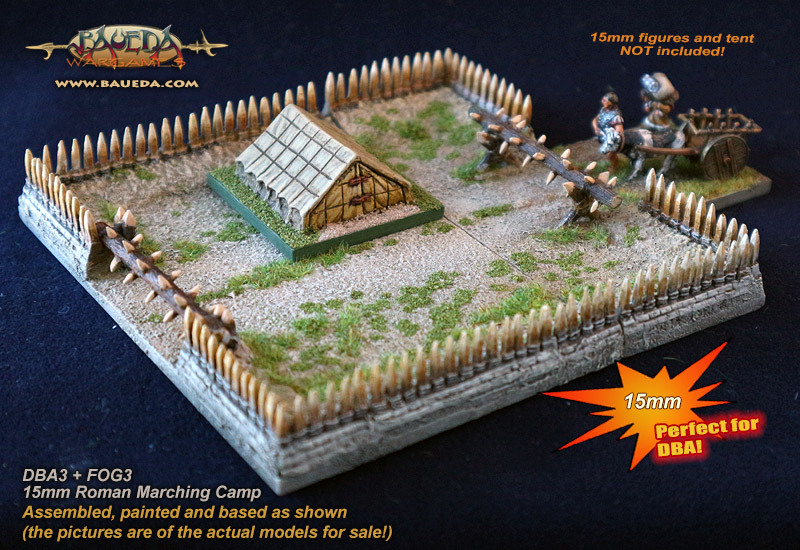 This unique piece is a complete painted and based model of a fortified camp, designed specifically to be used with 15mm figures and compatible with Field of Glory™ and DBX™ rules. The model consist of a perimeter of turf and stone-faced embankment surrounded by a ditch and surmounted by a walkway protected with a wooden stockade. It has a massive gate a full standard base frontage wide (40mm) on two sides, joined by an internal road. The external size is 200x200mm and the inner courtyard is 120x120mm, large enough to hold eighteen 40x20mm bases of troops or up to nine 40mm square bases of baggage or artillery! Three more bases of troops can be placed on the battlements on each side. It's based on 4mm thick plywood. Amazingly detailed and historically accurate, yet generic enough for being used from the Iron Age up to the early Middle Ages. It is also perfect to be used as a Built Up Area! Please note that the 15mm figures and tents shown in the picture are not included, they are there for size reference only! They are from our own range, available here. Currently in stock: 0 - SOLD OUT! Ready to play finished camps, assembled, based on 4mm plywood and painted as shown, are only available in limited numbers. (your choice of course! ); special projects are also welcome, inquire freely! 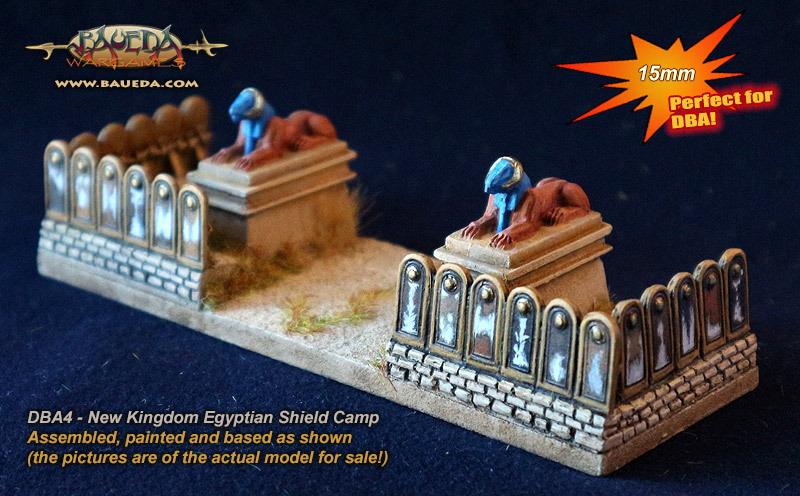 This is a fully assembled, based and painted model of an New Kingdom Egyptian Shield Camp set designed specifically to be used with DBA - DBMM™ rules. This model recreates this temporary fortification like those used by the army of Ramses encamped at Qadesh. The complete model as shown consist of a perimeter of fencing made with shields which leave a full module frontage (40mm) gap and two pillars each surmounted by a statue of the ram of Amon, as they are represented in NKE bas-reliefs of Ramses camp. The full size is 120x40mm (1x3 base widths) and there is enough space inside to hold a camp followers element. Ready to play finished camps, assembled, based on 4mm plywood and painted as shown, are only available in limited numbers. If we happen to be out of stock at the time of your purchase we will either refund your payment or treat them as commission order (your choice of course! ); special projects are also welcome, inquire freely! Want to DIY and save? Click here for DBA4 Egyptian Camp in assembly kit! Want a larger one? Click here for FOG4 Egyptian Camp in assembly kit! 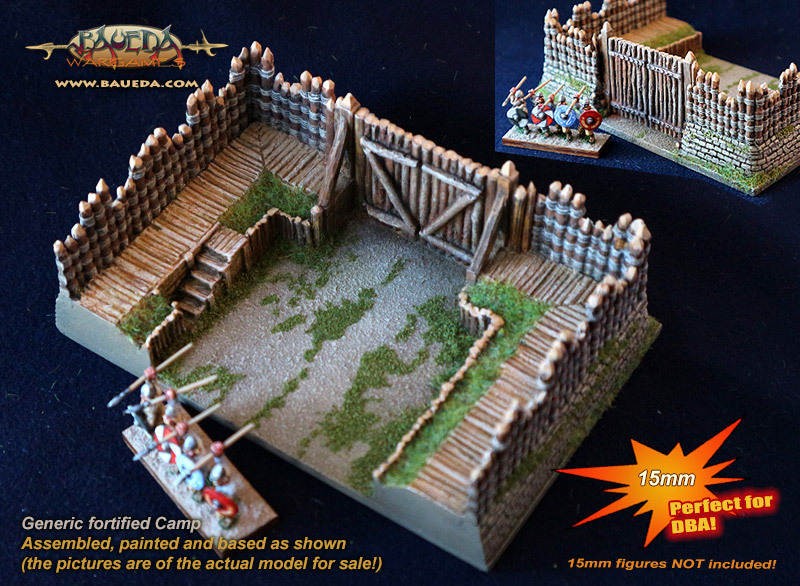 This is a fully assembled, based and painted 15mm model of a generic wattle fence enclosure, designed specifically to be used with Field of Glory™ and DBMM™ rules. The model can be used from prehistory up to contemporary settings in any rural area; it can be added to any ancient town or village and also used as animal pen. It has an external size of 120x80mm and is perfect also as a DBA camp. It has an inner courtyard large enough to hold lots of troops and/or a baggage train or artillery bases. Want to DIY and save? Click here for the unpainted wattle fence enclosure! This is a fully assembled, based and painted model of a generic fortification is designed specifically to be used with Field of Glory™ or DBMM™ rules. The model consist of a perimeter of embankment surmounted by a wooden stockade, which leave a full module frontage (40mm) gap closed by a wooden gate reinforced with bolted iron bands. It has an external size of 120x80mm and is perfect also as a DBA camp. It has an inner courtyard large enough to hold troops and/or a baggage or artillery base and even more troops can be placed on the battlements. These are two fully assembled, based and painted models of perimeter fortifications for a Roman Marching Camp, designed specifically to be used with Field of Glory™, DBA™ and DBMM™ rules. Both models consist of a perimeter of low embankment surmounted by a wooden stockade, which leave a full module frontage (40mm) gap barricaded with a spiked log. FOG3 has an external size of 120x80mm while DBA3 is 120x40mm (1x3 base widths) making it perfect to be used as a DBA camp by itself. The inner courtyard is large enough to hold camp followers and in the case of FOG3 also a baggage or artillery base or even a couple of 15mm Roman Legionary Tents available separately. Currently in stock: 1 Want to DIY and save? Click here for FOG3 Roman marching camp in assembly kit! Currently in stock: 1 Want to DIY and save? 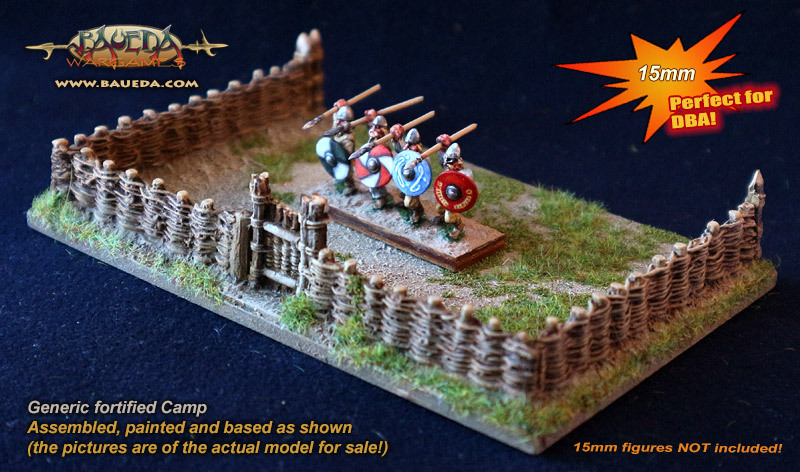 Click here for DBA3 Roman marching camp in assembly kit!